저널명EMBO J. 2017 Apr 13;36(8):1046-1065. doi: 10.15252/embj.201694781. Mitochondria play key roles in cellular immunity. How mitochondria contribute to organismal immunity remains poorly understood. 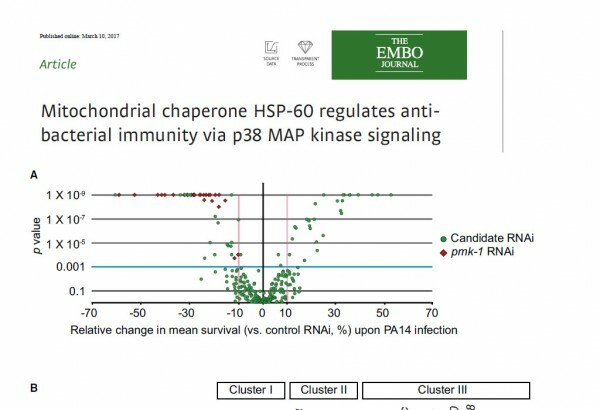 Here, we show that HSP-60/HSPD1, a major mitochondrial chaperone, boosts anti-bacterial immunity through the up-regulation of p38 MAP kinase signaling. We first identify 16 evolutionarily conserved mitochondrial components that affect the immunity of Caenorhabditis elegans against pathogenic Pseudomonas aeruginosa (PA14). Among them, the mitochondrial chaperone HSP-60 is necessary and sufficient to increase resistance to PA14. We show that HSP-60 in the intestine and neurons is crucial for the resistance to PA14. We then find that p38 MAP kinase signaling, an evolutionarily conserved anti-bacterial immune pathway, is down-regulated by genetic inhibition of hsp-60, and up-regulated by increased expression of hsp-60 Overexpression of HSPD1, the mammalian ortholog of hsp-60, increases p38 MAP kinase activity in human cells, suggesting an evolutionarily conserved mechanism. Further, cytosol-localized HSP-60 physically binds and stabilizes SEK-1/MAP kinase kinase 3, which in turn up-regulates p38 MAP kinase and increases immunity. Our study suggests that mitochondrial chaperones protect host eukaryotes from pathogenic bacteria by up-regulating cytosolic p38 MAPK signaling.